By now you've probably heard about the "Alice in Wonderland"-themed Halloween party that Obama threw back in 2009 and which the White House tried to cover up (a charge they're already furiously denying). Here at PJM Belladonna Rogers and J. Christian Adams have already blogged about it, so there's no need for me to go into the details any further. But the question everyone's asking is: Where are the photos? 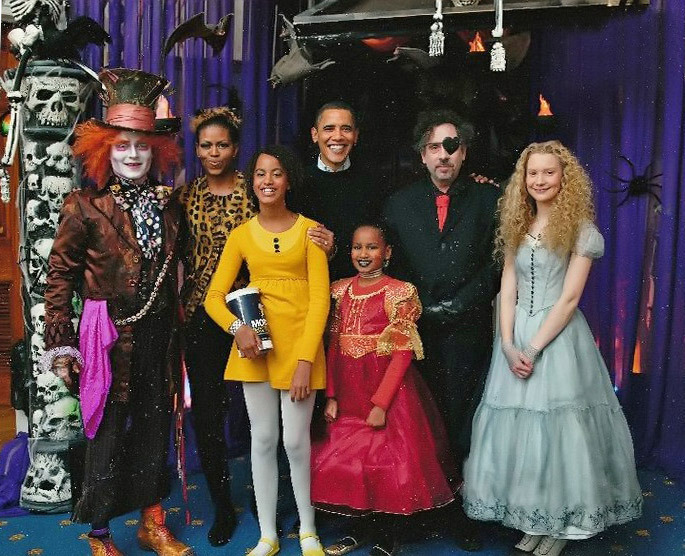 Johnny Depp as the Mad Hatter, an actress playing Alice in Wonderland, Tim Burton in costume along with the Obama family at the 2009 White House Halloween party. The original can be found here, and (as far as I can tell) was originally posted to a Johnny Depp fan site (with the wrong date, oddly). Pretty amusing – a portrait of Bill Clinton next to what looks like a Tim Burton-designed "Pumpkin King." You can see the rest of Jon Schnitzer's White House Halloween 2009 photos here. Following a trail that Morgen of Verum Serum got me started on, I've uncovered a cache of additional (mostly blurry) snapshots taken inside the party by (apparently) Jonathan Benya, an actor who starred with Johnny Depp in an earlier film and who was at the Halloween event. The full cache can be found at "Imagebam," a photo storage site, and further insider details are posted at the Russian-language Tim Burton fansite "Burton Land" -- English translation here. This one is the most interesting, because it shows some of the party-goers and chefs in the background and some of the treats and party favors on the table. Hatter tea party held at the White House dining room. Most of the cast of Alice were there. Johnny sat at the head word in a suit Hatter. The program also had a magic show, 3D paintings, Orchestra, tasting drinks, biscuits and a lot of other things. Johnny walked into the room and talked to people. Resident spoke with nearly all members of the cast. Guests are not allowed to take pictures, then, according to Kefir, there was "a ton of press photographers." On the Zone has brought the girl just because she is "scanned" the Internet in search of photos from the event. At the end of the evening Johnny went out without makeup. The girl said a few words in his "pirate style". Show sponsored by Johnny Depp and Disney. The guests were mainly represented by the White House staff and their children. As the description from the Burton Land commenter above reveals, there were three phases to the event: First, an outdoor party with kids and trick-or-treating (at which all the press photos were taken); then a private party inside the White House with Jonny Depp and all the "Alice in Wonderland" cast members in costume (at which the photos above were all taken); and finally an even more exclusive ultra-private adults-only affair at the end of the evening at which Depp (and the rest of the cast) had changed back into normal clothes. The question then arises: Where are the photos of this super-secret Phase Three? Want more? View the full sets at Imagebam here and here. A band of musicians dressed as skeletons performing outside the White House on Halloween, 2009. What were they playing - "The Politically Tone Deaf Funeral March"? Or perhaps "Brother, Can You Spare a Dime?" The official caption reads "A skeleton band performs at the North Portico of the White House in Washington on October 31, 2009." The New York Times included this image in a slideshow about Halloween at the White House in 2009. Another image from the slide show reveals butterfly dancers inside bubbles on the White House lawn. "A skeleton band performs at the North Portico of the White House in Washington on October 31, 2009," reads the official caption. There are plenty of photos on other sites of the trick-or-treating part of the evening (which seems to be not connected to the later Alice in Wonderland party), but if you're curious nonetheless, the This Week With Barack Obama blog has a pretty extensive photo collection of the Obamas and various White House staffers handing out treats to kids on Halloween 2009.